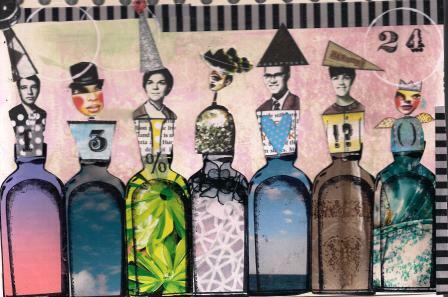 I used my new bottle stamp and stamped on magazine pages and then cut out. Looks fantastic! Great combination of collage and stamping! Hope Sarah gets better soon! This week is very fun! I've wanted to do this with bottle stamps too, just not enough time to get everything in when I want! I'm sure you know how that goes...as every crafter does. Eine tolle Seite - super Idee. Great idea! This way you can make a lot of different bottles with just one bottle stamp.